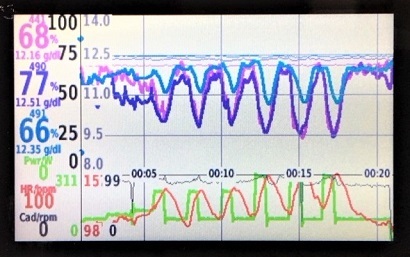 If anyone is interested, I've put a ConnectIQ datafield that graphs SmO2 (and Thb) from up to 3 SmO2 sensors together with power, HR and Cadence on Garmin's app store at https://apps.garmin.com/en-US/apps/ad58914e-b6b3-4135-91d7-30bb0e9d8723. Requires Edge 820, 1000 or 1030. So far found it to work reasonably well for me when I want to be able to briefly check the data and adjust my training rides on the fly - even with the small screen size. Is also more convenient for me than starting WASP+iOS app combination or sticking another ANT stick into my PC and running Peripedal in addition to Zwift. Overlay of the 3 sensors can also be easier to read and interpret than 3 separate graphs. All that said, whether this is useful to you may depend on your eyesight, lighting condition etc. It's obviously not meant for serious analysis nor for outdoor rides where the graphs and small font are even harder to read. Am open to suggestions how this could be improved if you have any - but the time I can put into further improvements is limited. Is still beta. One known issue is that the ANT connection does sometimes not recover from interruptions. I therefore recommend not to rely on the data saved from this app. Looks awesome, I installed it last night on Garmin 1000, but all I get is Searching under Moxy. I have configured ANT+ Moxy IDs. Do I need to remove other Moxy data fields, or I can have them together with your app? This apps looks very cool especially for racing. what is recommended\suggested filed size to be able to view it the best way on Garmin 1000? Hi Sebo, thanks for trying. Racing ... now that you bring that up, could imagine using this for Zwift racing. Not sure about IRL races ... but I got feedback from users of my other graphical data field (that shows MMP curve in real time) that they actually love to use it outdoors, so maybe possible if I make sure it’s readable. Current version requires full screen as I actually wasn’t even sure that full screen would be large enough. From my testing so far I’d say it’s at least large enough on the 1000 in landscape when on my trainer; need to experiment a bit more to judge if smaller sizes make sense. Probably also should work a bit to reduce amount of computation to reduce battery consumption. If my SmO2 is at 60% I do not attack at all, I go in to "preservation" mode and ride super efficiently drafting and being always on the "right" side covered from the wind. I'm actively looking and anticipating surges to be always ready to "hang on". If my SmO2 drops to 10% during surge, I'm looking back to see where I can safely recover, I will not try to hold on to the front group, or I will get dropped for sure. If my SmO2 is at 80-90% I have tons of room to play, I will attack, fake attack, bring friends over to the front, ride the front, FULLSEND kinda day, "on form", "good legs"
During those efforts I look at the data field and make real time decisions, currently problem starts when I want to know how many of those attacks or "deep digs" I already had. Since all my blood is in my legs, my brain is not working, I can't quickly recall: I attacked 8 times already, time to take it easy. With your data field I could very quickly see how many, when, how long ago I did last deep dig, it would be very useful in racing. I'm gonna a give it a go on Sunday during our provincial championships. - have another activity profile with the original Moxy data field ready and switch over if there are any issues (though haven’t tried if this really works). - with just one Moxy it would likely be better to fill the area under the curve to improve visibility, especially outdoors, possibly also colored as in the Humon smartphone app. Might try a few Zwift races to see for myself. Still waiting for lower temperatures in autumn before riding outdoors. Hi...i am a new user here. As per my knowledge a reversible PCB is very strange and really difficult to design!!! Of course, Zynthian AllInOne module is not, nor the controller modules. So … you have to solder every part in the right place. Unless you know very well what are you doing, nothing will work if you solder the connectors in the bottom side. I thought I responded to this post, but I guess submit didn’t work and I just realized my post never made it, I thought I owe you my comments. I have raced with your app on my primary Garmin 1000, I also had 520 in my back pocket just to make sure it collects all race data, as it was important race and I wanted to have all power data backed up. Your app is amazing, it really helped me in last 15min to stay cool and make sure my SmO2 is preserved for as long as possible. When I saw at the end in my last 15 min I didn’t have any systemic “digs” I knew I’m full recharged and ready for sprint. I actually won M2 provincial field, and I must say your app was big help, gave me mental confidence and also kept me in check from unnecessary attacks. This way I could have HR, Power as numbers in fields below.